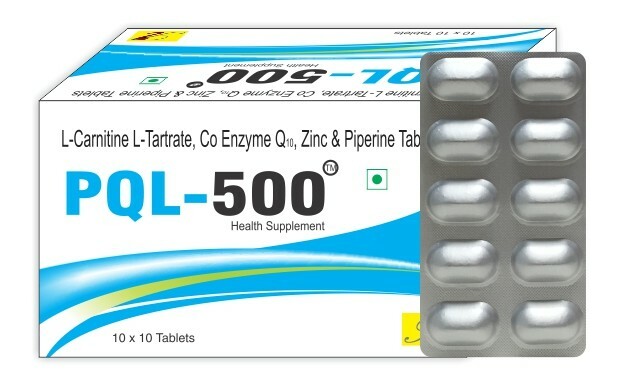 This combination of L-carnitine L-tartrate, CoenzymeQ10, Zinc and Piperine is useful to improve male fertility. Carnitine carries the lipids into the sperm which may provide energy and increases the sperm production and may decrease the lipid peroxidation. Coenzyme Q10 reduces the DNA damage caused by ROS. Zinc may be essential for the morphology of sperm because it is required to make outer layer and tail of the sperm (reduces apoptosis). Piperine given with this combination increases the absorption of Coenzyme Q10 and lowers the lipid peroxidation. Carnitine (endogenous) is a necessary component of fat oxidation in cells. Carnitines are quaternary amine synthesized from amino acids such as lysine and methionine. This amino acid is essential for functioning of sperm cells. 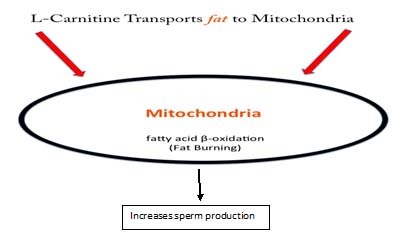 They are responsible for transporting long-chain fatty acids intothe mitochondria of sperm for intracellular metabolism through beta-oxidation. This will increase the sperm production. They also protect against ROS.The L form is used because the D form is not used in body. The new carnitine emerged L-Carnitine-L-Tartrate(LCLT) is used as it has no side effects. The LCLT causes less muscle damage and increases the testosterone levels. This will increase the chance of fertilizing the egg. The ubiquinol form of Coenzyme Q10 is given which is most powerful antioxidant. It is eight times more effective than ubiquinone. The vitamin like compound found in all our cells. It is present in particularly high concentrationin the mitochondria. It is another powerful antioxidant. It is concentrated in the mid piece of mitochondria. It reduces the DNA damage which is caused by free radicals in mitochondria. It is also best known for blocking the action that damages the cells. So, it is vital for male reproductive system. It is a mineral associated with normal functioning of male reproductive system. Zinc is required to make outer layer and tail of the sperm. It becomes lower in the infertile men. Zinc deficiency occurs due to increased oxidative stress, resulting in decreased sperm count and testosterone level. So, zinc is required in combination to increase thequality of sperm and the count of sperm. Genetic materials such as DNA and proteins cannot develop without zinc which makes it important supplement for men concerned with fertility. The American study have shown link between zinc deficiency and low testosterone levels. Zinc levels decline with age and men over fifty can fight impotency and by taking zinc. It is active ingredient of Piper Nigrum. It lowers the lipid peroxidation and increases the absorption of Coenzyme Q10. Mild insomnia, nausea, headache, fatigue, low B.P. Store in a cool dry place, protected from direct sunlight.